The Atlas 5 rocket is the future but its siblings -- the Atlas 2 and 3 vehicles -- won't be riding off into the sunset quite yet. With a few more years of heritage Atlas rockets launching from Cape Canaveral's Complex 36, Lockheed Martin has opted to combine those operations with Atlas 5 at Complex 41, forming one team of over 250 workers. "What we are doing is moving people from one pad to the other," said Adrian Laffitte, Lockheed Martin's director of Atlas launch operations at the Cape. Recently, the first Atlas 5 rocket was rolled from its assembly building to the launch pad for the final countdown dress rehearsal for its maiden flight. At the same time, workers were hoisting the first stage of an Atlas 2AS rocket onto launch pad 36A for a September 18 liftoff carrying a Spanish communications satellite. "The real challenge we had is can we really do what we said we can do when we combined the Atlas team of having dual operations. And the answer was yes. We proved that we can erect a vehicle on one pad and roll a vehicle on the next pad," Laffitte said. "That was the first time have had dual operations at Complex 36 and 41." Last Friday, the Eutelsat Hot Bird 6 TV satellite was transported to Complex 41 and mated to the Atlas 5, the same day the Hispasat 1D spacecraft arrived at the Cape from its manufacturer in Europe to begin pre-launch preparations. "We did not plan it like that, but sometimes it works that way," said Laffitte. There are 14 more Atlas 2s and Atlas 3s scheduled to fly through 2005, keeping Complex 36 active during the early years of Atlas 5.
International Launch Services, the U.S./Russian firm that markets both Atlas and Russian Proton rockets, says between 11 and 15 Atlas 5 missions are pending, including 7 for the U.S. Air Force. The exact number is not yet clear because ILS offers a "mutual backup" service that allows commercial satellites to be interchanged between Atlas and Proton to ensure on-time delivery in space. Some potential Atlas 5 users will decide closer to launch which rocket to buy. "The world is shrinking the time they want to go buy a payload to the time they fly," said John Karas, Lockheed Martin's vice president for Atlas 5 development. "It used to be 24 months to order flight, now it is 18, and with overcapacity (in the rocket industry) people are waiting until the very end." Four commercial Atlas 5s are scheduled through late next year. Those, coupled with the Air Force assignments, gives Atlas 5 some 11 launches. The first Air Force mission is expected in 2004. "I have to believe that the marketplace has rewarded us with a number of very significant orders for programs that are vital to our customers' businesses, expressing their confidence in the product," said Eric Novotny, ILS' vice president of marketing. The overall ILS backlog of firm Atlas and Proton mission stands at 33. In addition, it has up to 30 potential Atlas 5 mission options with specific government and commercial customers. Later this year the last Atlas 2A rocket will fly, carrying NASA's Tracking and Data Relay Satellite-J spacecraft into orbit from Complex 36. The least powerful Atlas currently in operation, the booster will be retired from service. There are six more Atlas 2AS rockets left, all have been sold and will carry various commercial and military satellites into orbit for two more years. For Atlas 3, which has flown successfully twice, seven more have been ordered by commercial and government customers. 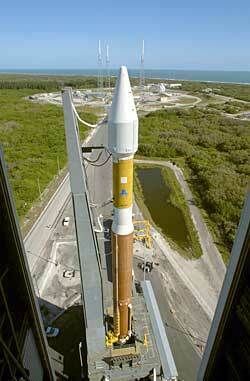 The last is slated to launch in August 2005 to send NASA's Mars Reconnaissance Orbiter on its way to the Red Planet. The Atlas family has evolved to more powerful rockets as satellite manufacturers follow a trend of building larger craft. 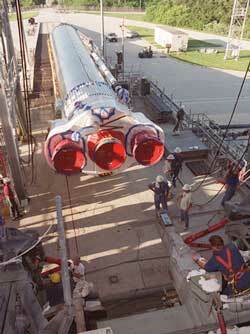 Novotny said from 1994 to 2000, most satellite payloads were between two-and-a-half and four metric tons. "That was very nice for Atlas 2ASs, very nice for the Atlas 3, but going forward what is happening? Well, satellites are getting bigger, they are getting heavier. As a result, launch vehicles have to grow to meet those requirements. Customers are building larger satellites, they have higher power, they have longer life. And to meet that, that's how Atlas 5 fits into the picture."